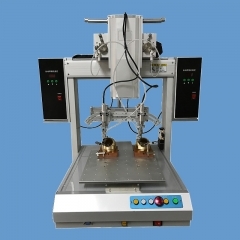 This model with double soldering iron head ,the floor plate use 12 mm steel plate which it has more than twenty kinds of processing program, stand column、beam also included.Guide rail, synchronous wheeland belt are all adopt "
2.Can be set the weight of fixtures , and according to the fixtures weight for motion control algorithm optimization;Welding tip has safety height setting function,which prevent the damage of welding parts. 3.Can be set three movement speed: automatic speed (the system automatically in the running time), manual speed (teach programming in the initial positioning), micro speed (teach programming in the accurate positioning). 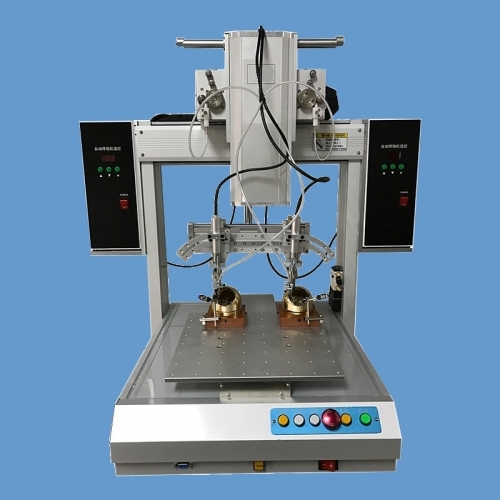 4.Can record the production information (welding production, solder spot quantity, welding time, total welding time), can choose single point/designated multipoint (provisions up starting point and end point)/single/cycle solder operation mode. 5.Can support point soldering and slide soldering at the same time,including point soldering parameter 100 groups,which can be meet various highly difficult technology demand of soldering operation and micro soldering. Application Used for welding various plug-in electronic components, such as capacitors, resistors, row, cable, screen, cover hand hole plug. with spot welding, welding, automatic cleaning, beating drag and other functions etc. with position correction, copy, array, automatic position. The machine is simple to operation,and the welding process parameters are precision, it can guarantee the welding quality. 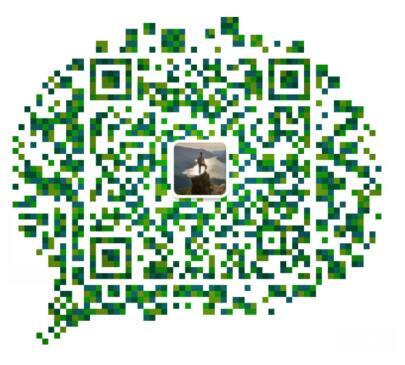 Use touch screen, friendly interface, simple operation, strong flexibility. We can according to customer requirements to develop machine. Packing term:1 unit/wooden case/Packing size is 80*70*105cm/Gross weight is 95KG. Delivery time depends on destination, logistics mode and other factors.items will be shipped within 10 working days after full payment is received. Tracking No. will be updated by email and tracking information will also be sent you. So We strongly suggest you to register as our Member. Thanks for joining AUTOK family.